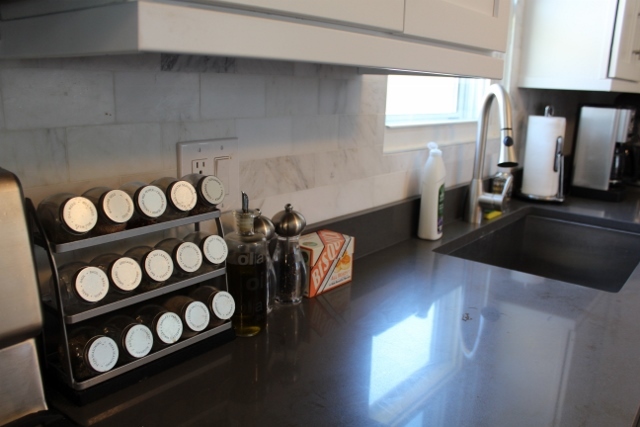 This post won’t be super educational in that it won’t explain, in step-by-step detail how we installed our backsplash. Why? The backsplash installation is the one part of the kitchen re-model that we didn’t do ourselves. I was so pleased with the way the backsplash came out. We went with gorgeous marble subway tiles. Here’s a close up. It was one of our only splurges in the kitchen (the fridge was the other). Given how the tiles were pretty expensive, and we had no experience installing backsplash, we thought it was best to get an expert. Plus, as part of the quote, we asked the contractor to install the top trim to the cabinets. Installing the trim wouldn’t be too difficult, but it would be time intensive. The contractor said he could get it all done in a day, which sounded great to us. Half way into the day, I got a call from Dan. Both of us were at work, and I knew it couldn’t be good. Apparently, the contractor informed him that he did not think we had enough of the marble subway tile to do the whole area. And the worst part is that Dan had been calling home improvement stores non-stop, and the type of tile we had wasn’t available anywhere quickly. O. M. G.
The contractors kept on working, while we tried to figure out a solution. We found similar tiles in that they were the same size, but they were glossy. Our tiles were more raw, and didn’t have any sheen to them. The contractor told us he could buff down the tiles to take the shine away, but we’d need to get them quickly if we wanted them installed same day. My wonderful mother-in-law went out and purchased a box of the shiny tiles for us. By the time I got home from work, the tiles were all buffed, and there was still a few feet of backsplash that needed to go up. Crisis averted. 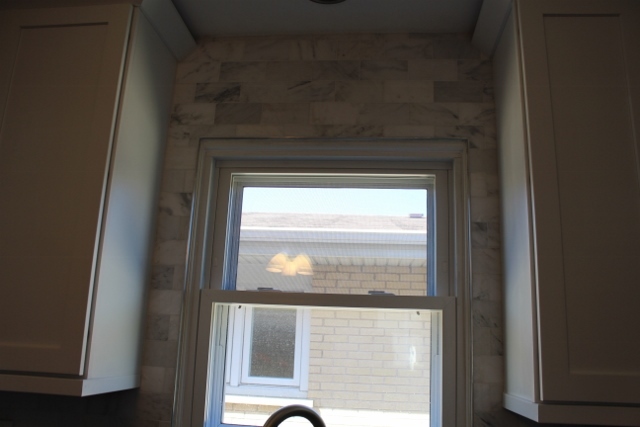 Looking back, I think the issue was that between the time we bought the tiles to the time we were having them installed, we decided to put backsplash tile all the way up the wall near the window. We measured out the added area to cover against what the tiles should have covered and thought we were OK. I don’t know, maybe we missed something, but I think this was were we went awry. Even with our unexpected setback, the contractors were done in one day. 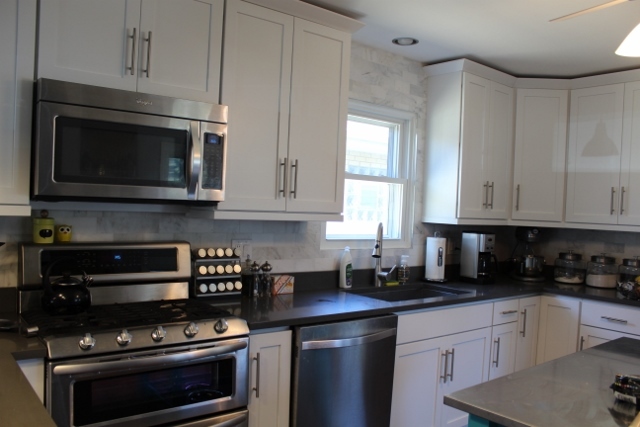 Given the slow and steady pace we had been used to, the drastic change by adding the backsplash and trim in one day was huge to us. We’re rounding the final lap and coming up to the finish line now. Just a few more kitchen updates to go!